I heard Jonathan Safran Foer speak with Vendela Vida (yep, co-editor of my favorite magazine ever) the other night as part of the excellent series City Arts and Lectures. After talking lucidly at length about his nonfiction book on the ethical implications of meat, Eating Animals, Vida asked him about a new book he had just finished called Tree of Codes. She showed him a copy (which is one of only ten dummies of the work extant) and he couldn’t contain his curiosity; he hadn’t actually seen it yet. He was fascinated by his own work for this reason: he didn’t write the words to this book, and its form is rather interesting. London upstart/art publishers Visual Editions reportedly came to him with this offer: “we can’t pay you, but on the other hand we’ll make any sort of book you can imagine.” Their second book, after their ambitious edition of Tristram Shandy, will be his reaction to this challenge (“It’s gonna have to be really interesting to make that worth it”). All the words were written by Bruno Schultz, in his classic collection Street of Crocodiles. What Safran Foer brought to the work was, well, scissors. Inspired by FBI, wartime or totalitarian redaction of documents, and by Schultz’ own erasure — Safran Foer called the work an “erased text” and told a little bit of the fate of Schultz, who was spared death for a time during the Holocaust by painting murals for a Nazi officer that were subsequently obscured, revealed, and smuggled from Poland by the Mossad — Safran Foer clipped away words revealing a new text: Street of Crocodiles. 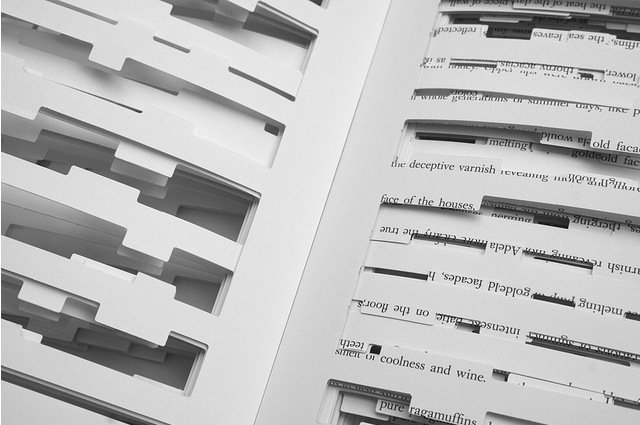 Visual Editions found a printer willing and able to make it: the published book, incredibly, will be diecut with a different die for every page. He described the process as something he expected to be fun but was in fact very frustrating. But, one excellent quote from the evening was something like “as time goes on I have less and less faith that I can write something good, but I have more and more faith in accidents.” The juxtapositions and phrases he found in the process are all creative accidents: they surprised him and were not what he would have come to with his own devices. Needless to say, I’m thrilled about the book. It’s right up my alley. 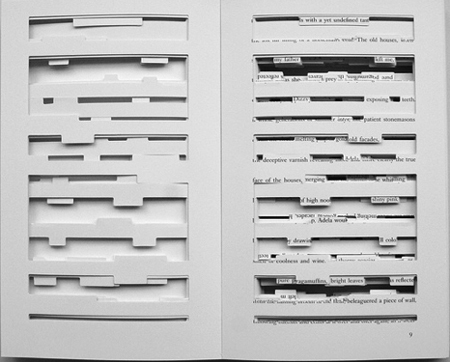 I am fascinated by redaction and erasure. I like diecuts quite a bit. And, not only does it conjure memories of Street of Crocodiles (which is great, distinctly textured, both as a collection and as a somewhat different film by the Brothers Quay — the entirety of which is in two clips after the jump) but of experimental writings I have loved. Burroughs used cut-ups. Oulipo writers have some games that start with found texts or otherwise artificially limiting word selection to force the creative accident. I dig artists books. 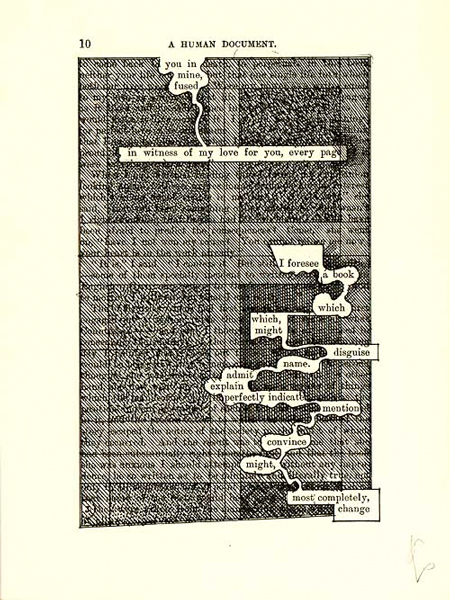 And my favorite artist book ever, A Humument, is a similar project to this one. I first encountered A Humument when its pages were exhibited at the museum when I was a kid. I found an edition years later as if from a remembered dream, and have bought three or four copies since. 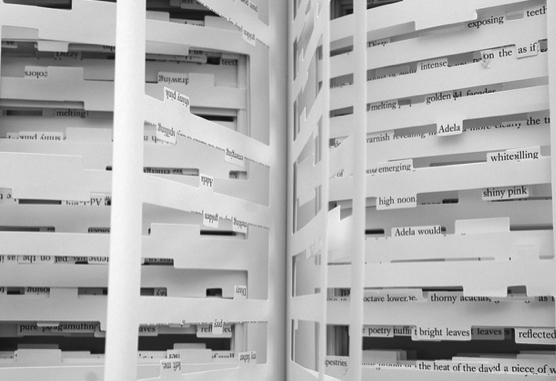 Artist Tom Phillips painted and drew directly over pages of the Victorian novel A Human Document, leaving words joined by proximity or rivers of white space to make new prose-poems (and a sort-of narrative starring a hero named “toge” who can only appear by name when the original text speaks of togetherness) with the remaining words; for each subsequent edition he’s repainted some pages differently so that the overall text changes over time, eventually becoming a wholly different piece than the original. More pics after the jump and the whole thing here. shop at our etsy shops!